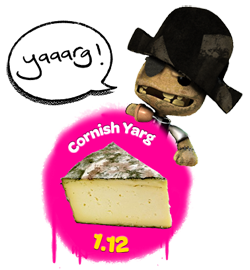 Cornish Yarg – a moist cheese from Cornwall with a fresh, creamy taste, and the name of the next content patch to hit the LittleBigPlanet. Support for Japanese and Korean IME for text chat. So hold on tight folks, only one more week to wait… Well, keep your fingers crossed that something nasty and unexpected doesn’t get in the way!